Disclaimer: This isn’t a perfect itinerary for a trip up to Buscalan, especially the part about heading back to Manila since my friends and I ended up being spontaneous about how we were going to end our weekend. I didn’t know what to expect when I started planning my trip to the mountains. In fact, I think I prepared myself too much by watching a lot of YouTube videos and reading up on blogs about the village I wanted to visit. The sole purpose of going up the mountains was to see the legendary Apo Whang Od, the oldest traditional tattoo artist or “mambabatok” in the province of Kalinga and I had scheduled to hike up in August to get a tattoo for my birthday. But an opportunity came for me to go there at an earlier date which I figured I’d do just so I’d be more prepared for the August trip. A group of three turned into a group of one and I had found myself contemplating on whether I should continue on by myself and this was only a couple of hours before the trip. The last time I traveled alone was just to Batangas and I ended up coming back the same day after realizing I didn’t have enough money to go to Puerto Galera. Fail. I was only 19. But I pushed on with it and by far has been the best decision that I had made in my life. deep and anxious consideration of one’s emotions and motives or of the correctness of a course of action. involving or expressing deep consideration. But I jumped on the soul searching bandwagon anyway and soon found myself armed with my Deuter backpack and sitting at the Victory Liner bus station waiting to board. The bus ride was smooth despite the weather worsening in Manila. Traffic was bad on EDSA but got better when we reached NLEX. I ended up sleeping most of the way through and only getting up from my seat for our first stop over at Sta. Fe in Nueva Vizcaya. I remember waking up and peeping out the window to check where we were and I had seen a cross from the corner of the window that wasn’t fogged up and finally realizing that we had reached the stop I was supposed to get off at; St. William’s Cathedral. My tour guide, Francis Pa-In had texted the night before and reminded me where I was going to meet him and so I ended up settling my bags down in front of a tindahan that was serving coffee. Unfortunately, 3-1 coffee was all they had, no barako this time. Kuya Francis finally came and told me that we were going to wait for another German tourist who was going to be getting off one of the buses. While waiting, he showed me business cards of who he’s toured up in Buscalan and also cited the names of celebrities and politicians. Not long after, we soon met Andy, a 20-year old guy who was doing an internship in Manila. He too had a group of friends cancel on him in the last-minute and had decided to do the trip on his own since he was leaving the country for good the following week. Together, we all walked down the street towards the jeepney that was being loaded with rice sacks and crates of soda bottles. Notes: There are no ATMs in Tinglayan so Tabuk is the last place to withdraw money. There is PNB in this town but I didn’t need to withdraw so you can ask your tour guide to take you there before jumping on the jeep. My bag, resting along with the piled up rice sacks in the jeepney. Another passenger lying comfortably on the roof of the jeepney. After passing through many Hobbitville-like towns, we finally got dropped off at Bugnay where Kuya Francis did not hesitate to start walking up the mountain. Andy and I followed with Andy carrying two bags while I had my hiking bag and a Deuter waist-pouch. By the 5th or 6th dirt step heading up, Andy and I were already huffing and puffing as we anticipated the rest of the hike up. Kuya Francis had actually borrowed a kid’s axe and chopped down a walking stick for me which I had found very useful while walking the 2-hour trail. The whole time, I was cursing to myself about the amount of stuff that I had brought and how I wish I had done more running rather than biking prior to the hike. I eventually got used to the weight on my back but allowed myself to take my time along the trail. Resting along the track heading up to Buscalan. Never-ending Rice Terraces along the track. And to think that we were actually walking within them. Andy and the paved track. 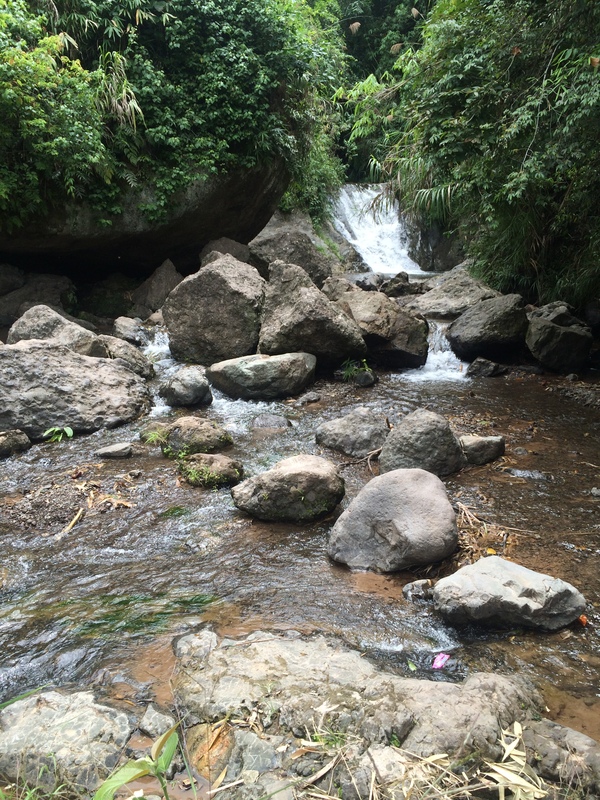 Nice and quiet waterfalls at the bottom of Buscalan village. Water stop. We finally reached the village of Buscalan where we were greeted by kids asking us for candy and pigs everywhere! After dropping off our bags at one of the houses, Kuya Francis toured us around the village and had a peak at Grace, Apo’s daughter, tattooing a visitor. Apo Whang Od wasn’t feeling too well that day as she had a headache and had a slight fever so she was resting at her place. Kuya Francis however knocked on her door and she was able to come down and see us. Andy and I were a bit hesitant to take photos with her but Kuya Francis insisted on it. Grace ended up running out of needles and so Kuya Francis secured a time slot for Andy’s tattoo for the next day. I ended up helping him decide on what tattoo to get and where to put it and so that gave Andy time to prepare for his very first tattoo. 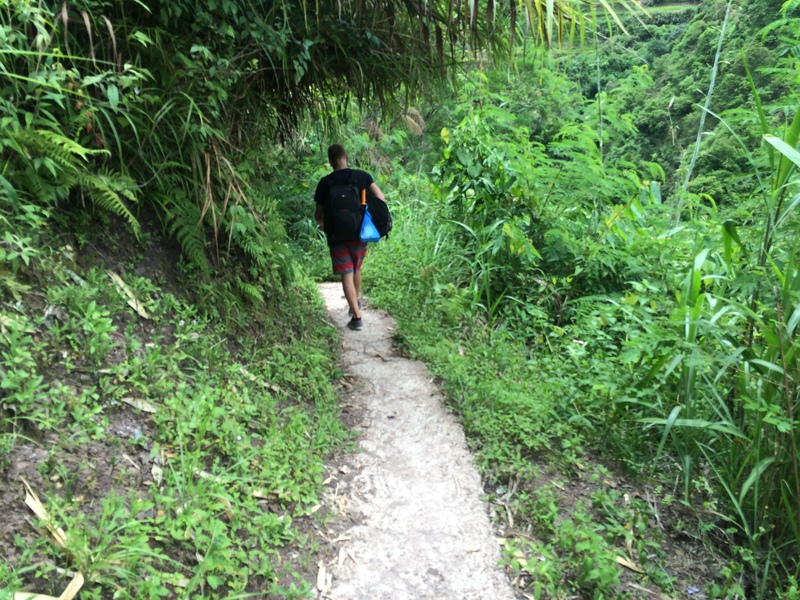 Notes: You cannot enter the village of Buscalan without a tour guide. I had booked for Kuya Francis to be my tour guide two weeks prior to my arrival but there are several tour guides and home-stay owners that you can contact and they will meet you at the turning point before the trek to Buscalan. The recommended tour guides are from Buscalan itself so my suggestion is to not trust a tour guide coming from Manila. Visiting Apo Whang Od at her house. Pigs, living the relaxed life in the village. Whang Od’s grand daughter working on a tattoo. Since Whang Od wasn’t feeling well, Grace took on the task of tattooing visitors who came to the village. As I sat there looking through the book, more people came to watch and to queue up to get their tattoos done. It was amazing to meet and be with a bunch of people who to came to Buscalan for that one single purpose; to be traditionally inked. Everyone had their own stories; some had skins like clean slates and some, covered with endless stories of realistic stamps and symbols embedded onto their skin. Each with their own story, but everyone had that one thing in common. We met our room mates, two girls, Krizia and Ja, who had already been in the village since Friday. We chatted for a bit and decided that it was a good idea to all leave the village together since they were set to leave the next day as well. Night time came and a simple dinner of rice, fried chicken and beans were served paired with freshly grounded coffee. I felt like a grandma that night and so instead of socializing with the rest of the visitors in the village, I ended up taking the rest of the night off. We woke up with Kuya Francis barging into our room to remind Andy that he was going to be first up to get his tattoo. We headed downstairs and there were people lined up, both inside and outside of the little hut where they usually perform their tattoo sessions. Apo starts working on Andy’s tattoo. Apo Whang Od finally came and started preparing the soot and needles with her wet wipes by her side. Andy removed his shirt and sat on a tiny stool with his knees perched up and his hands gripped together, anticipating the pain he would be feeling once the needle touches his skin. Apo started outlining patterns onto his back and soon after, she dabbed soot with the lemon grass needle and placed it on top of the drawn outline and tapped on his skin three times. Andy jerked and Apo stopped, not because Andy had jerked but because she wanted to change the needle. Andy’s face was painted with anguish as his hands gripped each other. I ended up taking videos and photos of the session for him and every once in a while, I would give him Mentos to chew on to help him deal with the pain. Apo Whang Od at work. The session ended up taking a little under an hour with Apo doing two tattoos on Andy’s back. While Andy was getting his tattoos, Grace and her cousin who was also taught how to make traditional tattoos, worked on other visitors who were lined up to get a traditional tattoo. Once done, Andy’s swollen creamy skin with his new tattoos glistened with the coconut oil that Apo had placed and despite the pain he had felt during the whole process, he was all smiles as people congratulated him for officially getting inked by the one and only Apo Whang Od. With our bags on our backs, we said our final goodbyes to the villagers and to Grace (and even bought coffee!). Leaving behind an Instax for Whang Od for her collection. Grace finally gets a photo taken with Andy. We finally headed down the mountain from the village and made our hike towards the turning point. Andy stayed inside the jeepney while Krizia, Ja and I sat on the roof for the rough 1.5 hour ride to Bontoc. We had to however say goodbye to Kuya Francis and his brother-in-law when we reached Bugnay as they had to pick up other tourists in Tinglayan. Last group shot with our tour guides. This is where the real adventure started. 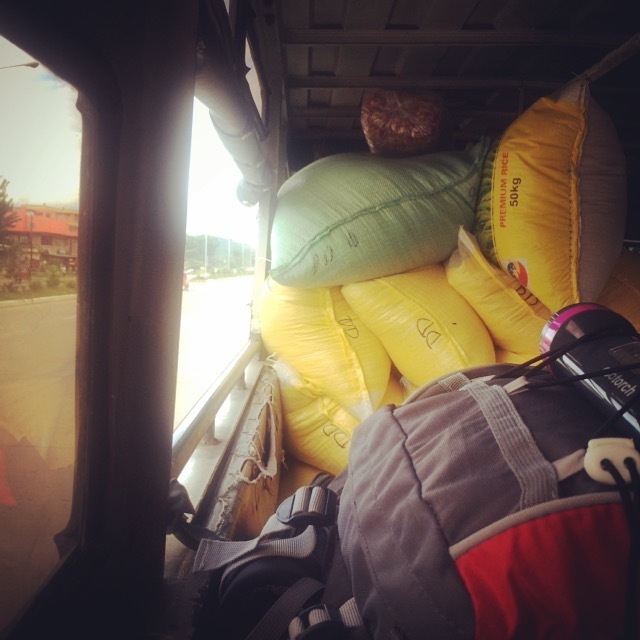 Our driver dropped us off at Bontoc where we settled our bags inside what seemed like a hotel lobby. Upon getting off the jeepney, another jeepney driver had approached us and offered us a trip to Banaue where he had practically brainwashed us on being able to see more sights than spending hours on end sitting on a bus heading back to Manila. Our original plan was to take a bus from Bontoc to Baguio and then another bus from Baguio to Manila. It was 11am and the four of us were far from wanting this trip to end. While sipping RC Cola in the hotel lobby, we contemplated on the driver’s idea of travelling to Banaue and just jumping on a bus to Manila from there but finally made a spontaneous decision to go to Banaue. In the jeepney, we introduced ourselves to two other foreign tourists who were headed in the same direction and we learned that they were Spanish and that they had only been in the Philippines for 4 days and had 5-weeks left. We convinced them to sit on the roof of the jeepney as well where we learned that they were cousins and suffered from vertigo. 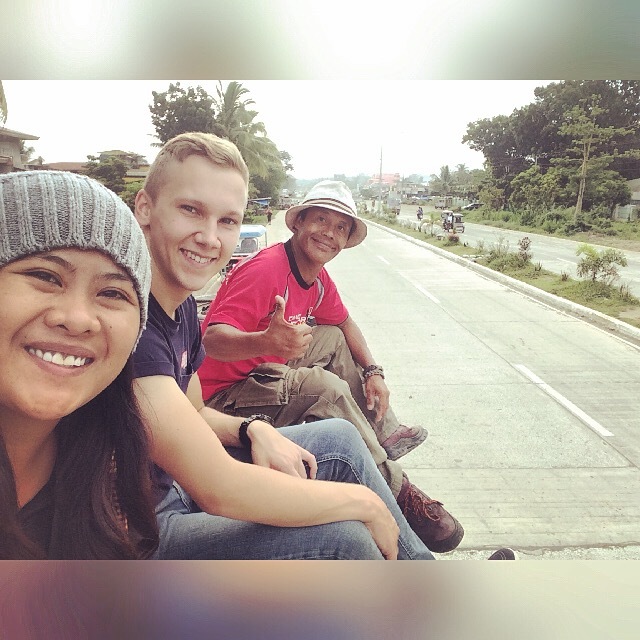 While driving through the windy roads heading up to Banaue, they hung onto the rails with their dear lives, their knuckles turning white from their strong grip. The weather turned for the worse as we approached Banaue Rice Terraces and as the driver dropped us off on the side of the road, our little group of four turned into six with our two new Spanish companions, Borja and Rafa. They ended up joining us for the rest of the trip since we were all heading for Manila. While waiting out the rain in a small souvenir shop overlooking the rice terraces, another bunch of local tourists had started chatting with us and was oddly interested in our little backpacking adventure. 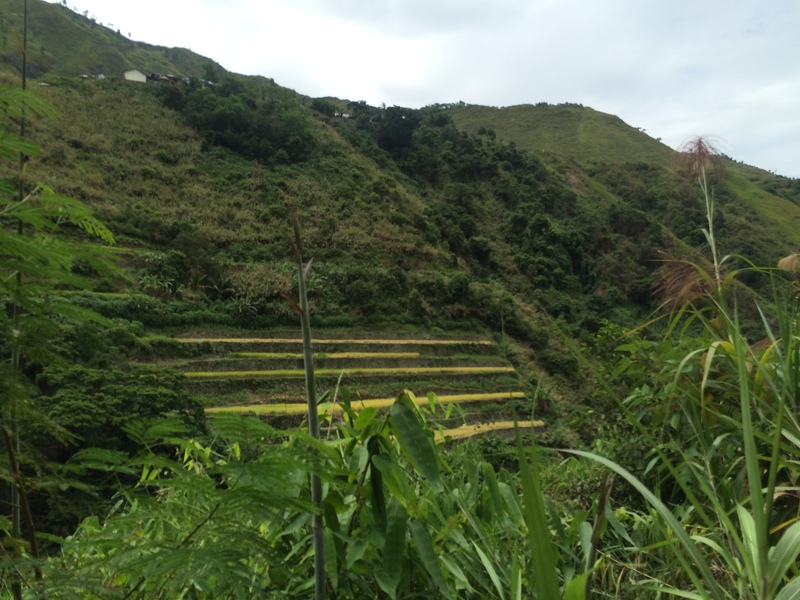 We learned that they were heading back to Manila from Sagada and had decided to pass through the Banaue Rice Terraces. Of course, they had a car with them so travel wasn’t a problem. At that point, we were unsure of how we were going to leave that spot and decided to replenish ourselves by having lunch at the closest restaurant. We ended up taking a tricycle to Banaue City Proper and riding a jeep that would take us to a place called Bagabag Junction where we were told a lot of buses from Tuguegarao and Vigan passed through. The weather was getting worse as we rode from Banaue to Bagabag Junction. We were unsure of where we were except for the time I happen to look out to see Ifugao State University. At that point, I turned to Krizia and we gave each other high-fives after realizing that we had spent the day traveling to so many places that we never thought we’d visit. We arrived at Bagabag Junction where we had a quick snack while watching out for buses heading to Manila. It was nearing 6PM and we were worried that we were going to get to Manila at around 5AM. With a little prayer, we were finally able to jump on a bus headed straight for Cubao and we arrived in Manila just before 2AM. I ended up spending a little over P3000 for the entire weekend and that didn’t include the tattoo but the feeling and the bond I had made with the people, the village, and especially the mountains is priceless. It is safe to say that I did go searching for my soul in the mountains but once I got back to Manila, I realized that I had actually left it back there. There’s a comfort in knowing that in less than a month, I’ll be heading back up to those mountains and finally getting my own traditional tattoo; a birthday gift to myself. Even if I don’t end up seeing those that I met and bonded with over the weekend again, at least we experienced Kalinga together and that memory will definitely last forever. For the first time, I had actually found it hard to put into words what I had experienced up in the mountains. It’s just not enough to keep this experience to myself and to have a mental memory of what I had seen. There were too many times I had wished I had packed my DSLR camera to capture those moments and to just take out a piece of paper and just write how I felt. But it’s a lot different when you’re there and all you want to do is just breathe everything in. I’ll be heading back to Buscalan next month for my birthday and will finally get my own traditional tattoo. After seeing Andy get his tattoo, it has given me confidence to get mine done as well and that the anticipated pain will just another experience worth having. Until then, everyday I’ll be wishing to take me back to the mountains. ← Onto the Road Less Traveled. Sorta.